I’m Joe Mangino, and I live with my family in the Jersey Shore town of Beach Haven West. Five years after Hurricane Sandy, we’re still on the long road home. Sandy took away my house and my livelihood. Like many of our neighbors, the Mangino family was knocked down. But we got up, made new friends, rebuilt and refused to be knocked out. We’ve learned so much from the storm. More than anything, I’ve learned that we’re strong when we stand together. I joke that I hugged more people in the year after Sandy then I had in the first 40 years of my life. But we’ve also learned how much needs to be changed. Too many of us are still hurting, because of greed, government inertia and indifference. If Sandy taught us we can rebuild, it also taught us that we must find a better way. Our home, along with 40,000 others, was totally wrecked by Sandy. When we first saw our house after the storm, I don’t think I’ve ever felt more helpless or clueless. We were broke. All the money we had in the world was what was in my pocket. No money to rebuild. No money for rent. No money to pay the mortgage. This became a defining moment for me, because now instead of helping others I was the one that needed help. What were we going to do? Where was my family going to live? Little did I know, something amazing was about to happen. 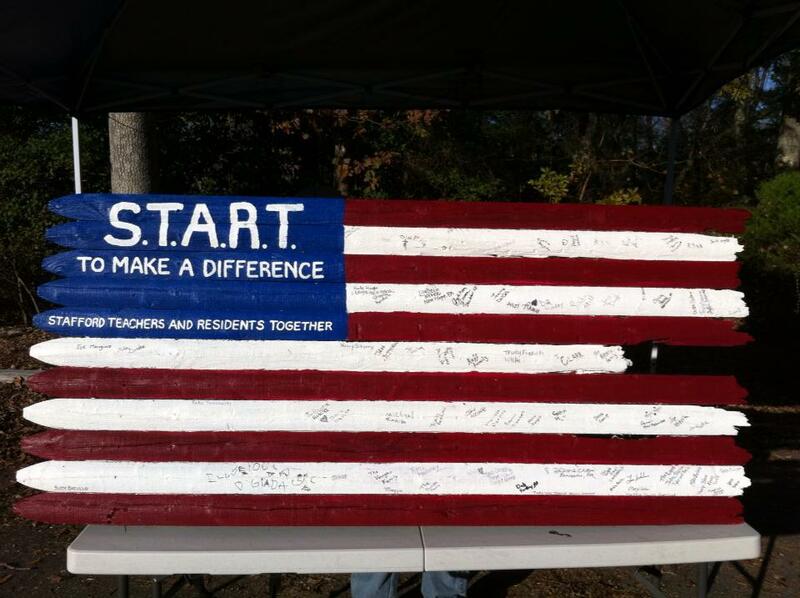 A group of teachers from my wife’s school showed up and began to help us gut our home, and save what could be saved. After my home was done, we helped my neighbor. Then we helped another. And my gutted home became a relief center for volunteers to gather. That was the beginning of a little grassroots organization, Stafford Teachers and Residents Together (START), and then the New Jersey Organizing Project (NJOP). Over the next year, we ended up gutting over 800 homes and saving taxpayers more than $4 million in cleanup costs. Almost overnight, we became experts in demolition, construction, mold remediation, and psychology. The emotional toll was high. Day after day, I’d drive down streets whose curbs were stacked high with people’s personal belongings. We did the best we could to bring some sort of comfort and aid to those around us. We were blessed, because in this time of trouble friends, family, strangers and neighbors came together to help each other pick up the pieces, and get our towns started on the road to recovery. I was blessed because the storm made me uncover skills I didn’t know I possessed, and turned me into a leader in my community. Our long road home has been filled with many obstacles. Surviving the storm was the easy part; the real battle was the fight to recover and rebuild. Ripping out sheetrock was a piece of cake, compared to the man-made disasters all around us. What I foolishly thought would be a six- to eight-week displacement turned into a years-long nightmare. Mortgage companies did the bare minimum to help homeowners. If you were lucky, you were granted a 90 day forbearance, but then at the end you had to pay it all back in full, so it wasn’t helpful. People had to cash in retirement plans to rebuild or to pay for a rental while also paying the mortgage on a house they couldn’t live in. By March 2013, my health was also a mess due to mold exposure. I had to use an inhaler everyday just to breathe. The stress on the entire family was intense. As a father, it broke my heart to see my two children sleeping on the floor of the cramped room we lived in for seven months because I couldn’t get my insurance money. For sanity’s sake, we returned home to live in our gutted house. It was fun for a few days, but washing your dishes in the bathtub gets old real quick. Still, we fought every single day. We stood up to insurance companies, mortgage companies, utilities and crooked contractors. And worst of all, I had to fight New Jersey’s rebuilding program, the so-called Rehabilitation, Reconstruction, Elevation and Mitigation Program (RREM). RREM was meant to disburse $1.1 billion in federal funds to help impacted families return to their homes. But the very program that was supposed to be our lifeline turned into a noose that nearly choked off my family like so many others. So what have we learned in the last five years? 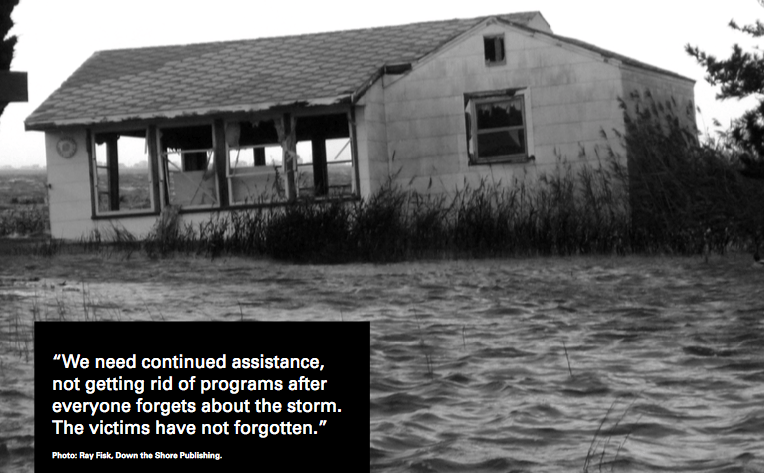 According to a new report by the NJRP, almost a quarter of our Sandy families are still not home, five years after the storm. 70 percent of survey respondents reported new physical or mental health problems or worsening pre-existing conditions. 57 percent believe we are not better prepared for future disaster. I have to say, with all that I know now, they’re right. We’re doing all this fighting to get families home and make sure they can afford to stay home, right? Well let me ask you, what’s the plan for the next storm? What are we doing to deal with climate change? You know who doesn’t have an answer: the state of New Jersey. We are the only state that borders an ocean with no plan to deal with sea level rise. Sandy gave all of us an education, but I don’t see the lessons learned being applied by our leaders. It breaks my heart, and disappoints me greatly, that our agencies and elected officials aren’t using the lessons of Sandy to help those affected by Harvey, Irma and Maria. In New Jersey, we need to push for a comprehensive management plan that will better prepare us for the next storm. We don’t need band-aid solutions. We need reforms to the National Flood Insurance Program (NFIP) that will provide for mitigation prior to a disaster. Reforms that will make flood insurance more affordable. And reforms that will actually work for the people, and not just for the insurance industry. When my insurance company underpaid my claim and gave me a “take it or leave it” offer, I had little recourse. It wasn’t until New York and New Jersey elected officials fought for our FEMA claims to be reopened that I got a chance to get the money I felt was owed to me. Four years later, I was finally able to get a claim check. How much, you might ask? $43,000. Not a lot over four years. It was a relief to finally see that money, but it would have had a bigger impact back in 2012 when I really needed it. That’s why we support the SAFE NFIP Act, which applies our hard-learned lessons from Sandy and makes sure other families don’t suffer like ours. Even though we are home now, I’m still worried about our future economic security. The jobs haven’t come back, and we still have work to finish our houses. My wife is a teacher, so we should be able to have faith in her pension but our pension system is in big trouble partly because of the same guy that botched the Sandy recovery, Governor Christie. Many families are walking the tightrope right now. We are one illness, one major car repair, one unexpected job loss away from losing everything. And we can’t allow that to happen. So what have I learned from Sandy? That family is more than blood relatives. It’s your friends, neighbors and active community members. And you know who can find and fight for solutions? We can.